This page explains how to manage an App Engine project using Apache Maven, a software project management and comprehension tool. It is capable of building WAR files for deployment into App Engine. Google provides a plugin and Maven Archetypes which are included with Maven 3.5. When you use Maven, you don't need to manually download the Java libraries from the App Engine SDK. Maven automatically downloads the appropriate libraries when necessary. You can also use Maven to test your app locally and deploy it to production App Engine. If you don't have Java, download, install and configure it. Set the compiler flags in the pom.xml to specify Java 7 bytecode or Java 8 bytecode. See the appropriate tab below for the settings. Note that the App Engine Java 7 runtime requires Java 7 bytecode. The Dashboard opens after your App Engine application has been created in your project. 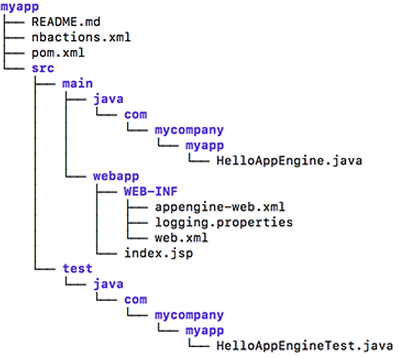 Install the App Engine SDK for Java and add the directory to your PATH. Note: Ensure that you always have the latest version of the App Engine SDK for Java. You must update the SDK periodically. App Engine app guestbook-archetype Generates the guestbook demo sample, complete and ready to run and test. The following procedure describes how to use App Engine Maven archetypes to create an App Engine application. Change directory to a directory where you want to build the project. Set -Djava8=false to deploy the project in the Java 7 runtime. Set -Djava8=true to deploy the project in the Java 8 runtime. Set -DCloudSDK_Tooling=false to use the App Engine SDK for Java tooling. When prompted to choose an archetype, choose the value 2 for the App Engine skeleton archetype. This creates an empty project that contains the required directory structure and files. When prompted for version, press ENTER to select the default most recent version. Wait for the project to finish creating the necessary directories and files. Then go into new project directory, for example myapp/. Add the UI that you want to provide to your app users. For more information, see Handling Form Data. During the development phase, you can run and test your app at any time in the development server by invoking the App Engine Maven plugin. The procedure varies slightly depending on the artifact used to create the project. If you haven't already done so, build your app (mvn clean package). Shut down the app and the development server by pressing Control+C in the Windows/Linux terminal window where you started it, or CMD+C on the Mac. Notice that the <port> sets the port here to 8181 as shown, and the address 0.0.0.0 is specified, which means the development server will listen to requests coming in from the local network. See the Deploying your app guide. The App Engine Maven plugin goals can be categorized as devserver goals, app and project management goals, and Endpoints goals. Performs an asynchronous start for the devserver and then returns to the command line. When this goal runs, the behavior is the same as the devserver goal except that Maven continues processing goals and exits after the server is up and running. Stops the development server. Available only if you started the development server with appengine:devserver_start. appengine:backends_stop This stops any running development server listening on the port as configured in your pom.xml file. This goal can be used in conjunction with the devserver_start command to do integration tests with the Maven plugin. appengine:backends_configure Configure the specified backend. appengine:backends_delete Delete the specified backend. appengine:backends_rollback Roll back a previously in-progress update. appengine:backends_start Start the specified backend. appengine:backends_update Update the specified backend or (if no backend is specified) all backends. appengine:enhance Runs the App Engine Datanucleus JDO enhancer. If you use the update goal, your update attempt may fail with a message similar to this one: 404 Not Found This application does not exist (app_id=u'your-app-ID'). This error will occur if you have multiple Google accounts and are using the wrong account to perform the update. To solve this issue, change directories to ~, locate a file named .appcfg_oauth2_tokens_java, and rename it. Then try updating again.